After spending nearly two months as a Fulbright ETA in Pangkal Pinang, Indonesia, I have been through the gamut of getting-to-know-you questions. Some of them are standard and would be asked of foreigners in nearly any other country. However, others seem to be uniquely Indonesian. Listed below are twenty of the questions that seem to resurface again and again, along with my thoughts and advice on answering them. 93 percent of the time, this is the first question that you will be asked by any Indonesian. (For the remaining 7 percent, see question 3.) I always respond with Dari Amerika [from America], clarifying that I am from Chicago if the asker seems interested. Mentioning Chicago usually prompts an enthusiastic reference to Michael Jordan, which was surprising at first but is now my descriptive trigger when Chicago alone draws a blank stare. 2. Can you speak Indonesian? If you manage to answer question 1 correctly with minimal response time, the asker may express some surprise and then follow-up by inquiring about your general Indonesian language ability. After learning Indonesian for one month my answer is definitely sedikit-sedikit [just a little] but I feel like no matter how much my language improves in the next eight months my answer will always be sedikit-sedikit. 3. Can I take a selfie with you? If selfie-ing were an Olympic sport, Indonesia would definitely take home a medal. Selfie-selfie is a national obsession, and nothing stirs the selfie-urge of Indonesian youth more than the presence of a bule, aka a white-skinned foreigner. Everyone from students to cashiers to immigration officials can’t resist the lure of a selfie with a foreigner, especially if you look like the imagined stereotypical American (i.e. blond hair and blue eyes). Be forewarned that selfie-selfie is contagious and if you consent to one, you may well open a Pandora’s Box of selfies that can take an agonizingly long time to escape. Although asking someone her age in the United States may be considered rude, it is de rigueur in the Indonesian getting-to-know you process. Age is important for determining where you are in the social hierarchy, which affects the language — both verbal and physical — you are allowed to use. Elders are to be shown respect and youth are expected to show deference through actions such as touching the elder’s hand to their forehead as well using polite forms of address. 5. Do you have a boyfriend/girlfriend? Sometimes Indonesians will skip this question and launch right into question 6. However, whether you get this question or the following one, I can guarantee that you will be asked by nearly everyone about your relationship status. You have been warned. The fact that I am 22 and still unmarried vexes some Indonesians, especially older generation aunties. Social pressure for young women to wed is immense, and the ability of a woman to work outside of the home once she is a wife depends largely on her husband’s wishes. It has boggled more than a few minds that I might want to wait until the spinsterly age of 30 or beyond before considering getting married. 7. Would you like to marry an Indonesian? This question is contingent on your response to the previous question. If you are not married back in your home country, then surely you must be interested in marrying an Indonesian! What other reason could you possibly have for traveling so far from home and staying for so long if not to find a mate? Of course I am joking, as are most of the people who ask this question. Still, if you say yes — or even just maybe — be prepared for the asker to start listing the virtues of his or her closest unmarried relative. 8. How long are you here? This question usually comes in two parts: how long have you been here and how long will you stay. As I keep meeting new people, I am painfully aware of quickly time is passing. “I have been here for two weeks” turned into “I have been here for two months” seemingly overnight, and “I am leaving in two months” will be here before I know it. Use this question as a reminder of how short nine months really is. 9. What are you doing here? 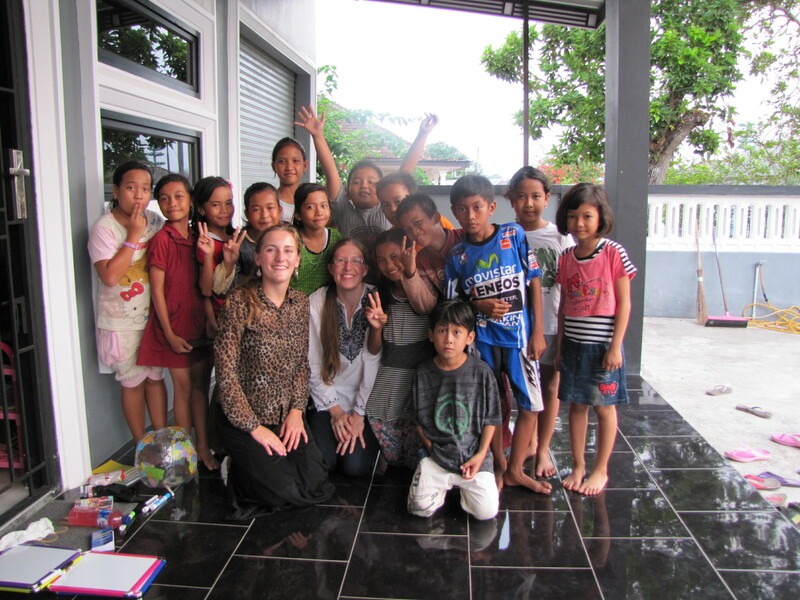 Caitlin and I on our front porch with the neighborhood children, who would be eager to come learn English at our house as often as we would be willing to teach. Once the asker knows that you are in Indonesia for more than just tourism purposes, the next question will naturally be what you are doing here. I have started preempting this question by explaining that I am an assistant English teacher at a local high school whenever I am asked question 8. 10. Can you teach me English? Nearly everyone, from the girl selling juice down the street to the nurses at a local emergency care clinic, won’t think twice about asking you to teach them English. As an ETA, my responsibility to teach lies solely at my school. While I am happy to let anyone practice speaking English with me, I always stress that if you want to learn a language, you have to work hard and practice often. Much to the chagrin of my students and strangers alike, I don’t have a magical quick-fix for achieving fluency in English. While asking about your religion in the U.S. is not an ideal question for when you first meet someone, in Indonesia it is a perfectly acceptable topic of conversation. Indonesia is predominantly Muslim, but Protestantism, Catholicism, Buddhism, Confucianism, and Hinduism are also recognized as official religions. Indonesians are generally tolerant of differences, though they are quick to correct any sign of disrespect. When you are asked this question, you can usually expect the asker to offer to help you find a place to worship if you haven’t done so already. And if you are not particularly religious, you can expect to have some earnest discussions about faith and your beliefs if you admit to this fact. Anyone seen walking on foot, Indonesian and bule alike, will be accosted by this question by even the most casual observer. Jalan-jalan [lit. walking-walking] is an acceptable answer if you are, in fact, just taking a walk. Jalan-jalan is also a good answer if you would rather not explain your business to every household you pass. 13. Where is your friend? You are only likely to get this question if you are frequently seen in public in the presence of someone else. For example, I share a house with Caitlin Jordan, a fellow ETA, who also probably looks like my body double to most Indonesians. We are both pale, blonde, wear glasses, and are exactly the same height. We usually run errands together, so when I am out and about on my own this question is guaranteed to come up. 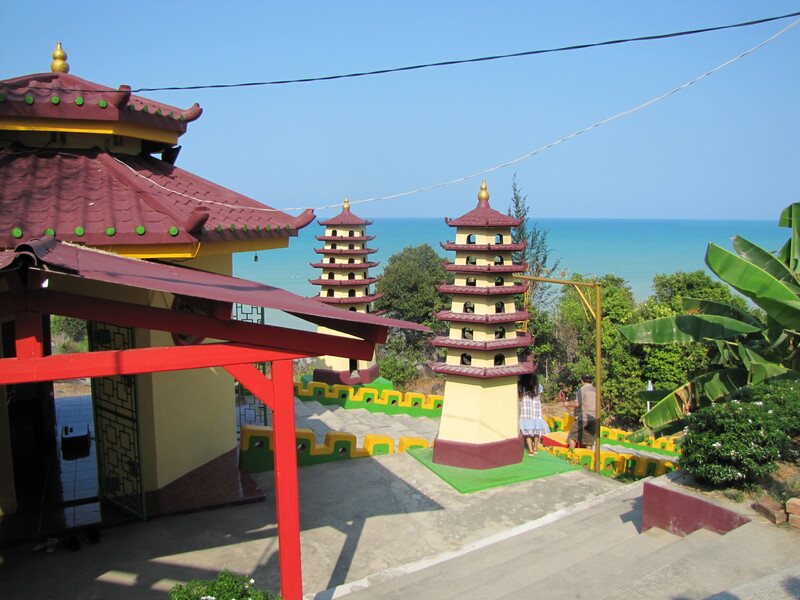 A hilltop Buddhist temple in Pangkal Pinang with inviting blue water of Pantai Tikus [lit. Rat Beach] below. Despite the unappealing name, this is one of the best beaches in Bangka. 14. Have you been to the beach? When you live in a country that has umpteen thousands of miles of coastline, going to the beach is, understandably, a common pastime. My town has easy access to several beaches. Frequenting them on Sunday, the only full day off for students and government employees, is part of a weekly routine for many of my students. 15. Have you tried the local food yet? Indonesians are proud of their local cuisine, and for good reason! Some dishes such as nasi goreng [fried rice] and gado-gado (or any of its many incarnations) can be found in most regions. However, there are also many regional specialties that are unique to certain islands. No matter where you go in Indonesia, you should certainly taste the local culinary specialty as it will delight your taste buds as well as your Indonesian hosts. 16. Do you have BBM? BBM (Black Berry Messenger) is to my Indonesian students what AIM (AOL Instant Messenger) was to American students of yesteryear. You will find that social media is huge among Indonesians in every demographic, so this question could also be applied to Facebook, Line, Path, Whatsapp, Instagram, and whatever other platform happens to be trending at the time. I generally communicate with students exclusively through Facebook so that I am not spammed with “Hai Miss” on my phone at all hours of the day and night. When students are forced by their teachers/parents to talk to me (in English, of course) this question is generally the go-to conversation starter. Since I have been in Indonesia I have found that my hobbies have changed from hiking and reading to studying Indonesian and singing karaoke. 18. Do you feel at home here? In Indonesian there is one word, betah, that roughly means to feel at home or to feel comfortable. Once I looked this word up in the dictionary after I had been here for several weeks, I realized that people had been asking me this question all along. Indonesians genuinely care if you are happy in their country, so when this question comes up you will make the asker very happy if you respond with a resounding yes. 19. Do you want to live in Indonesia forever? 20. What will you do after your year as an ETA? Last but not least, I have been surprised by the number of people both at my school and in the wider community who are interested in my plans after this year. The aunties who ask question 7 (Would you like to marry an Indonesian?) generally think that I should stay and start a family in Pangkal Pinang, but that is not exactly what I have in mind. What I’ll do instead remains to be seen. Note that I speak largely in generalities, and each ETA’s experience will be different depending on his or her gender, age, ethnicity, and other factors. Kelly Fitzgerald is currently a Fulbright ETA in Pangkal Pinang, the capital city of the beautiful but lesser-known island of Bangka. She was born and raised in Chicago and is a recent graduate of the University of Tampa. When she is not teaching she enjoys making lists (ergo this post), laughing way too much, and exploring Pangkal Pinang. You can follow her blog at http://mskellyfitzfulbright.wordpress.com/.